Often times, safety issues involving semi trucks and other types of light trucks make the news because of major accidents or the recall of faulty parts – stories that shed negative light on the auto industry as a whole. However, in a joint effort between the Insurance Institute for Highway Safety (IIHS) and auto manufacturers to improve vehicle safety that dates back to 2003, the auto industry has brought something positive to the table. Auto makers teamed up with supporting organizations to create safer, more practical designs for vehicles in order to reduce the number of injuries and fatalities in automobile collisions. The start of these increased safety efforts began in 2003 when experts began to notice a geometric incompatibility between large vehicles and smaller ones, creating a greater risk of serious injuries and fatalities. Leaders in the industry expected the National Highway Traffic Safety Administration (NHTSA) to develop a compatibility standard for SUVs and pickup trucks, but instead offered an alternative solution. 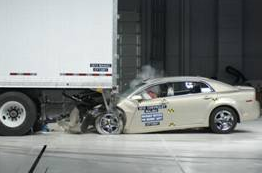 As one could imagine, a light truck crashing into a smaller car does not bode well for passengers of the smaller car. The overall size and weight of an SUV or pickup truck would cause significant damage to smaller cars on its own, but add to it a geometric disadvantage that allows larger automobiles to ride up on the bumper of a compact car and you have a recipe for disaster. But now, according to this, SUVs and pickups are more geometrically compatible with smaller cars so that the risk of serious injury or fatality is decreased significantly. A “big difference" may be an understatement: the death rate for passengers in minivans being struck by SUVs weighing between 3,000 and 3,499 pounds declined 63 percent. SUVs weighing more than 2 and a half tons saw a 45% decline in their death rate. The researchers involved in the study attribute the improvements in safety to the redesign of the front ends of SUVs and pickup trucks that, in the past, would override bumpers of smaller cars during a collision. This process creates a significantly higher risk of permanent injury and fatality for passengers. It may have taken a few years for these strides to take effect, but significant decreases in the number of fatalities during auto accidents and improvements in light truck safety are things that can have us all feeling safer on the road.